Today on homify 360 we head to the mountains, in search of a magnificent home located in Nova Lima within an ecological reserve. The perfect place for a modern weekend getaway. 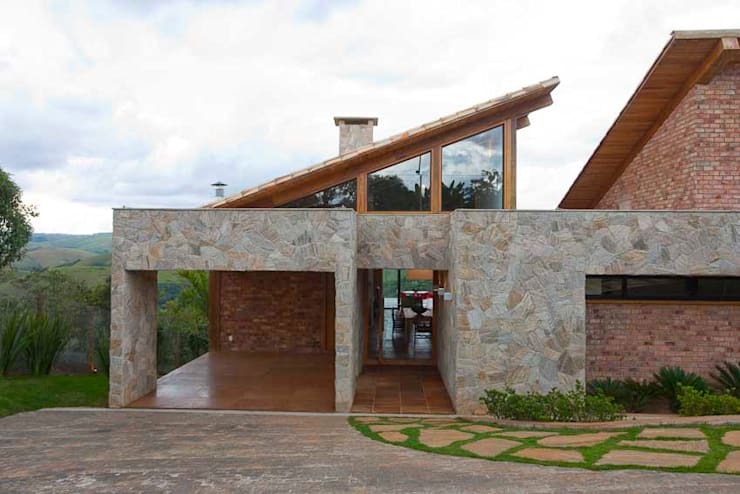 The amazing wood and stone cabin-style home has been designed by the excellent team at David Guerra Architecture in Brazil. The home is elegant yet rustic with a simple and charming interior, set amid a beautiful natural landscape of panoramic mountain views. 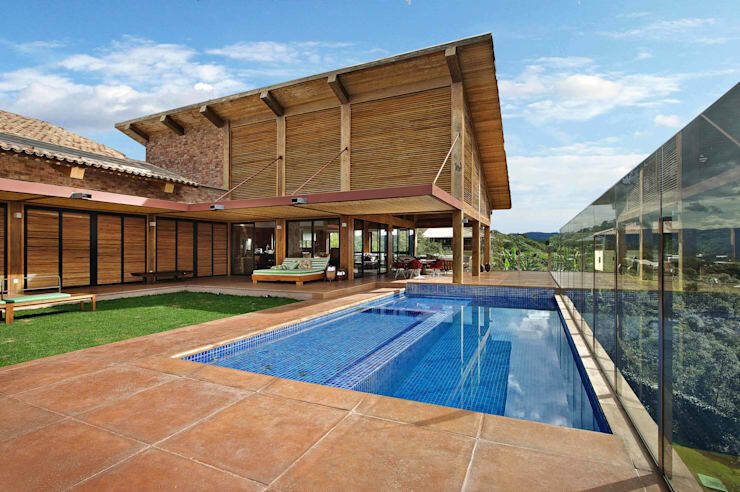 This home is comprised of natural materials such as wood, bamboo, straw and stone and is 745 m² of space, that has been excellently integrated into the surroundings! The architectural team managed to excellently combine the different tastes of all the family members in order to create this fantastic mountain home… this was a daunting task! However, the main façade with its exceptional stone coated clean lines created a stunning exterior. This home displays a contemporary fusion of modern and traditional design, which was only achieved by the merger of various style choices! The façade maintains a strong and solid character, which almost blends in with the mountainous surroundings! Perfection achieved! As a result of the natural slope, the home was planned in two separate floors, however most of the social spaces are situated on the ground floor of this villa. The space houses the living, dining and kitchen quarters as well as four suites. A highlight of this home is the design of the steep roof, which allows for extra sunlight during the day while creating a high ceiling! The social zone is spacious, but with the roof height, the area seems even larger! 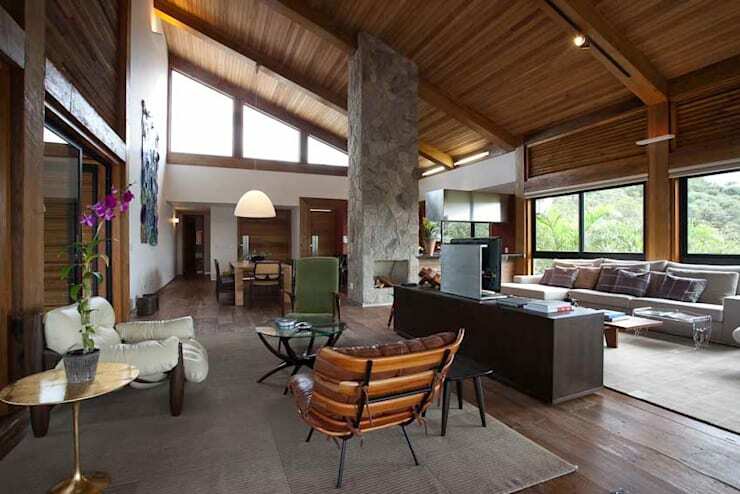 The design of this interior area is undoubtedly rustic, charming and pleasant. If rustic style is what you are after, then have a look at: The homify guide to rustic home style. The social space in this home is open plan, which means that the living room, dining room and kitchen have all been combined into one area, ensuring a great family experience! The large dining room is perfect for days when extra family comes up for a day visit, while the kitchen has an informal eating space for those quick meals together. The wooden dining room table is simple and elegant, making the perfect addition to this rustic country home, a design completed by the country style dining room chairs that enhance the traditional interior atmosphere. Each aspect of this space has been carefully chosen and makes for a harmonious and comfortable ambiance! This fantastic kitchen is dominated by warm colours, adding a contemporary and modern feel to the traditional and rustic environment of this villa. 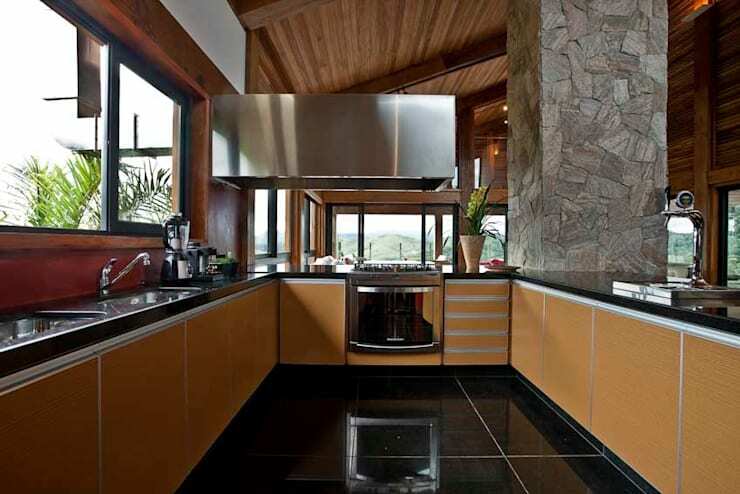 The kitchen has a unique cutting edge designer appeal, the modern appliances, as well as the red wall along with the lacquered yellow wood cabinets creates a personal touch, while the bench and flooring in black granite completes and balances the elegant space. 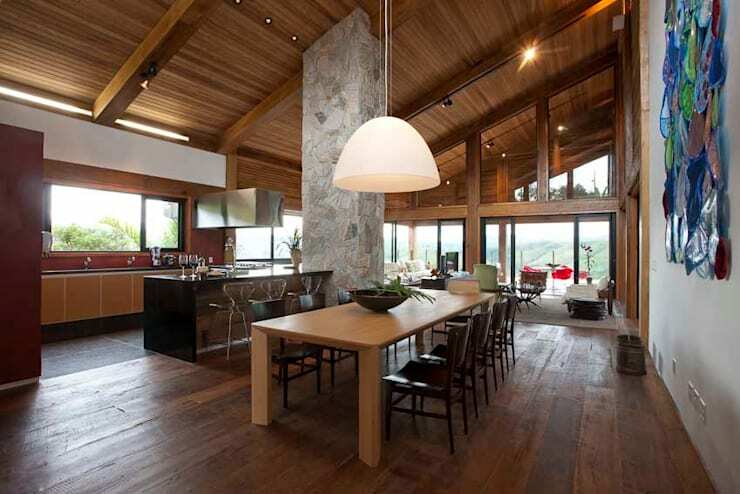 The kitchen has ample natural sunlight during the day, while a view of the landscape can also be enjoyed! An open plan kitchen is the perfect way to play host… you will never miss out on the conversation and fun again! This exceptional bedroom is absolutely relaxing and comfortable, making it the perfect escape from the busy working world. Spend your days nestled in the cosiness and warmth of the blankets and get that rest you deserve! 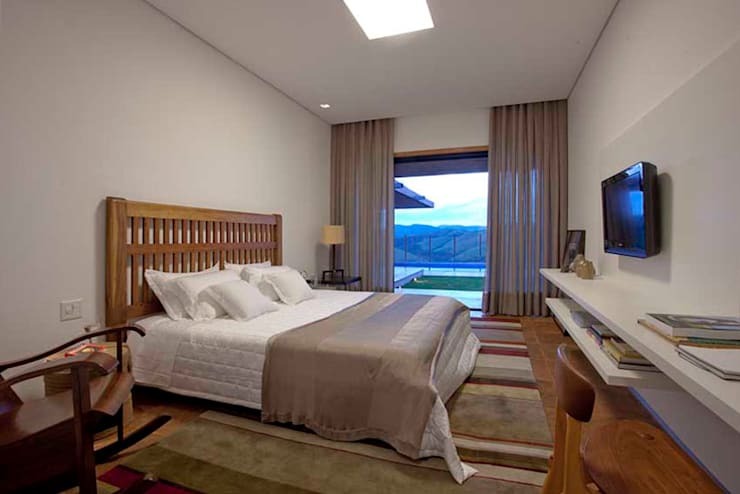 The neutral colours of the furniture, furnishings, bed linen and curtains creates a serene and tranquil space. If a bit of scenery is what you require, simply open your curtain and enjoy a view of the magical mountains from the comfort of your balcony! Forget camping out in the open, this may just be the best way to enjoy nature… especially if you are a creature of comfort! It's more than just a romantic and private space, this bedroom is a solace too! This recreation area includes a brilliantly blue swimming pool, adding another level of wonder to this beautiful home in the mountains. Spending time outside with family and friends under the pergola, a meal from the barbecue or just taking in the sights from the poolside… this patio has something for everyone! Unfortunately, that brings us to the end of our homify tour today, but this mountain home is surely unforgettably amazing! If you liked this rustic styled home, then The Home Between Rock and a Great Place is worth a read too! Does rustic style do it for you? Do you think they nailed it with the design of this house? Let us know your thoughts!